Blue Origin is a company best known for being the first in the world to successfully land a reusable rocket on a landing pad. The company plans to take space tourists aloft using a reusable suborbital rocket called New Shepard, and also to target orbital flights using a new rocket under development called New Glenn. The firm has funding from customers as well as Amazon.com founder Jeff Bezos. Previously, NASA provided Blue Origin with more than $25 million in contracts (payment was based upon milestones completed) for the Commercial Crew Development program, which is working to develop privately funded space vehicles to bring people to the International Space Station. Ultimately, however, NASA chose to support SpaceX's Dragon and Boeing's CST-100 spacecraft for the flights. Blue Origin is known in the space industry for not releasing much information about its flights and aspirations ahead of time, unlike companies such as SpaceX and Virgin Galactic. Blue Origin was registered as a company in 2000, and first made it into public attention in 2006 after Bezos made a series of land purchases in Texas. According to the Wall Street Journal, these purchases were made under names such as "James Cook L.P.," "Jolliet Holdings," "Coronado Ventures," and "Cabot Enterprises," which all traced back to the same address. The corporate names, incidentally, all were based on famous explorers. Computational Fluid Dynamics (CFD) image of Blue Origin's next-generation Space Vehicle. In January 2007, according to MSNBC, Blue Origin's website opened for business, featuring videos and photos from such milestones such as a November 2006 test flight. Blue Origin received two rounds of funding from NASA: $3.7 million in 2010 for the first round of the Commercial Crew Program, and $22 million for the second round in 2011. The company's first major disclosed setback came in 2011, when a development vehicle failed at around 45,000 feet in altitude during a flight test. "A flight instability drove an angle of attack that triggered our range safety system to terminate thrust on the vehicle. Not the outcome any of us wanted, but we're signed up for this to be hard," wrote Bezos in a Sept. 2, 2011, update to the company's website. He added that the company was already working on another development vehicle. The next "short hop" took place in November that year. October 2012 saw tests of the crew capsule escape system; the company dubbed the event "a great day in Texas" on its website. The system soared to 2,307 feet (703 meters) before returning by parachute. "The progress Blue Origin has made on its suborbital and orbital capabilities really is encouraging for the overall future of human spaceflight," NASA Commercial Crew Program manager Ed Mango said in a statement. "It was awesome to see a spacecraft NASA played a role in developing take flight." 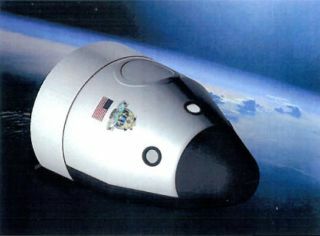 However, as the Commercial Crew program continued, NASA chose rival systems SpaceX Dragon and Boeing CST-100 to provide crew flights to the International Space Station. This left Blue Origin reliant on finding other customers to eventually support its work. One of the income streams Blue Origin will pursue for New Shepard — which is named after Mercury astronaut Alan Shepard — is space tourism. A date for flights hasn't been disclosed yet, but when it does happen, the view for paying passengers will likely be spectacular. Here's what space tourists can expect: New Shepard will launch for about two and a half minutes. After main engine cut off, the crew capsule will separate from the rocket. Passengers will be weightless for about four minutes, and will be able to see the Earth's curvature from an altitude of about 307,000 feet (93,573 meters). The spacecraft will then re-enter the atmosphere for a safe landing on Earth. New Shepard has undergone three iterations over the years, making seven test launches as of May 2018. The latest flight, on Dec. 12, 2017, took a mannequin called Skywalker (named after a "Star Wars" character) into space, as well as several experiments that generated revenue. Blue Origin’s pusher escape system rockets the Crew Capsule away from the launch pad, demonstrating a key safety system for both suborbital and orbital flights. Image released Oct. 22, 2012. One of the frontiers of space exploration right now is creating reusable rockets. SpaceX is another company that has been working on the concept for years, but Blue Origin beat them to the punch in landing on solid ground several weeks before SpaceX. On Nov. 23, 2015, New Shepard flew just past the boundary of space (62.4 miles, or 100.5 kilometers). The rocket and vehicle separated as usual, but the rocket did not fall back to Earth. Instead, it moved toward a landing pad and softly touched down with the assistance of its engines. "Rockets have always been expendable. Not anymore," stated a blog post on the company's website written by Bezos. "Now safely tucked away at our launch site in West Texas is the rarest of beasts, a used rocket. This flight validates our vehicle architecture and design." SpaceX landed its Falcon 9 rocket successfully on land in December. Then Blue Origin followed up its world first on Jan. 22, sending the same New Shepard rocket and a vehicle up into space to 63.2 miles or 101.7 km. Following the flight, Bezos wrote that the company may soon have plans to share for a more powerful orbital system. "We're already more than three years into development of our first orbital vehicle," he wrote. "Though it will be the small vehicle in our orbital family, it's still many times larger than New Shepard. I hope to share details about this first orbital vehicle this year." That orbital launch system is called New Glenn, which is named after Mercury astronaut John Glenn. This rocket is expected to make its first flight around 2020. Future customers include Eutelsat Communications, One Web and Thailand's mu Space Corp.
Blue Origin will also attempt to make New Glenn available for national security government missions. Most of that work is performed now by United Launch Alliance with its Atlas and Delta IV rockets. Blue Origin also plans a moon flight program called Blue Moon, which would take place further in the future.